Stay at AK Hostel, you can enjoy the convenience of the best shopping location and great services offered by a Travel Agency! This is truly an ideal hub for shopping lovers. Erawan Shrine, Central World, Siam Paragon, Watergate Market & Big C are all in 3-10 minute walking distance. AK Hostel offers 9 dorm rooms and 1 double room (shared bathroom), so as the facilities include free Internet kiosks, common TV rooms, and laundry rooms. We also invited Taiwanese artists to design all our four bed dorm rooms bringing fun Thai cultures into the rooms, such as Thai boxing, Floating market, ancient Ayutthaya culture and etc. 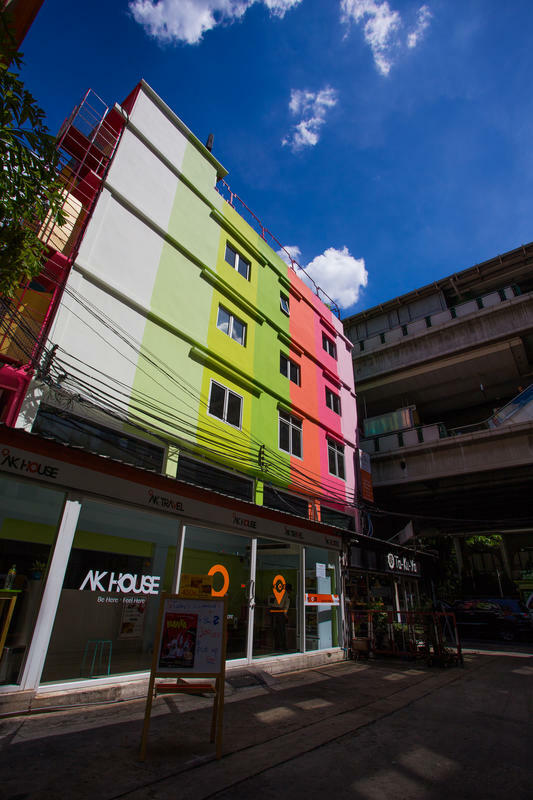 - AK Hostel is a 5 story building with NO elevator, you may need to carry your own luggage up to your room. - We encourage you to bring your own lock for safe storage. Our locker is 56cm*36cm big. - Private double room (Bunk Bed) is shared bathroom. The bathroom is located at the 5th Floor, about 11.5 square meters large, with No window. Express Red Line: 90B/ one way, 06:00-01:00. Take airport rail link to Phyathai station (N2) and then transfer BTS to Chit Lom station (E1, Direction to Bearing). Ak Hostel is just located right in front of Exit No. 3. ** We suggest you to take taxi if you travel with more than 1 person. The expense will be more or less the same and it will be more comfortable and fast. Service time: 24 hours, run by legal taxi companies. Estimated fee to AK Hostel is 450B, about 40 mins. Estimated fee to AK Hostel is 500B, about 50 mins. Reminds: Please follow the direction to Taxi stand. There is no subway connection at DMK airport. You may need to transfer from airport bus to subway. Taxi is probably the most convenient way to arrive AK Hostel.